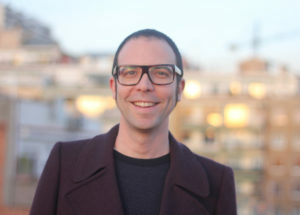 Albert Forns (Granollers, 1982) is a journalist and a catalan writer. He works for the magazine Time Out Barcelona, the newspaper ARA and the cultural center CCCB. As a writer he has published the novel Jambalaia (Anagrama, 2016), winner of the Anagrama Prize; Albert Serra (la novel·la, no el cineasta) (Empúries, 2013), winner of the Documenta Prize; and the collections of poetry Ultracolors (LaBreu Edicions, 2013). He has participated in numerous literary festivals, such as Barcelona Poetry Week, Kosmopolis and the Primera Persona Festival. When he was younger he was the driving force behind numerous cultural initiatives on the Internet, which won many awards but which nobody read, like the online magazine of literary criticism Llibrofags (UPF Prize and finalist for the Lletra award from the UOC) and the extinct Projecte Embut (Netreporter Prize awarded by the Barcelona Council), a mixed bag of artistic and literary creation and essays. He regularly writes on theater, literature and visual arts for his blog as well as for Time Out magazine and the digital magazine Núvol.com. As a journalist he has chronicled festivals of film, theater and visual art (the Venice Biennal, Documenta in Kassel).